There’s a lot out there about how to reduce conflict at work. A lot of the stuff out there is very good. This episode is about transforming conflict, and using it to your advantage. If conflict seems like something to avoid? If it seems like something you can win? Then, you’re doing it wrong. Breathe: Try something called box breathing. Practice it anytime you feel a bit anxious or angry. Breathe in for a count of four. Hold your breath for four. Breathe out on a count of four. Hold for four. Breathe in for four. Repeat. This may not be practical during an argument, but it’s great before initiating a conversation that you anticipate may be stressful. And, even during the interaction, bringing your attention to your breath, and doing this box breathing as much as possible is a powerful fight or flight defuser. Just ask a Navy Seal. This is a technique they use in actual battle. Look for common ground. Actually take a moment with your collaborator, your employee, your negotiating partner, whomever. Name the things you agree on in detail — breadth and depth. Notice how much common ground you have that surrounds the points of contention. It’ll put the disagreement in perspective and remind you of how aligned you truly are. Puzzle it. Sit on the same side of the table — literally or figuratively — and investigate the problem. You’re looking together at a jigsaw puzzle, trying to find the solution. Your pieces aren’t better or worse, or even yours. Theirs neither. They’re not your ideas or their ideas. All ideas are joint property. They’re all just puzzle pieces. And they either fit, or they don’t. Murder the unchosen alternatives. When the decision is made about which direction to go down — yours, theirs, a third unrelated one or a hybrid of the two — put your doubts to rest. You may not be able to quash them, but don’t feed them. Instruct yourself, “We’ve made a decision. Whether I agree with it or not is irrelevant. That ship has sailed, and my job is to back this plan of action to the hilt.” Every plan of action but the one that was chosen is done. Burn your boats. Don’t dwell. And if it’s your plan that’s in action, don’t gloat. By following this approach to difference and conflict, you’ll reap rewards. Your relationships will thrive. Your blood pressure will improve. Your organization’s decision making will be more effective. Your results will be better. If you want, you can think of this as the “BLIMP” method. If you look above, you’ll see the steps? BLPM. Ok. BLIMP is a stretch. I just know people like acronyms. 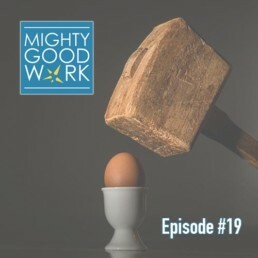 Your host on Mighty Good Work is Aaron Schmookler. And, we’re The Yes Works — Helping to make work good for people, and make people good for work.